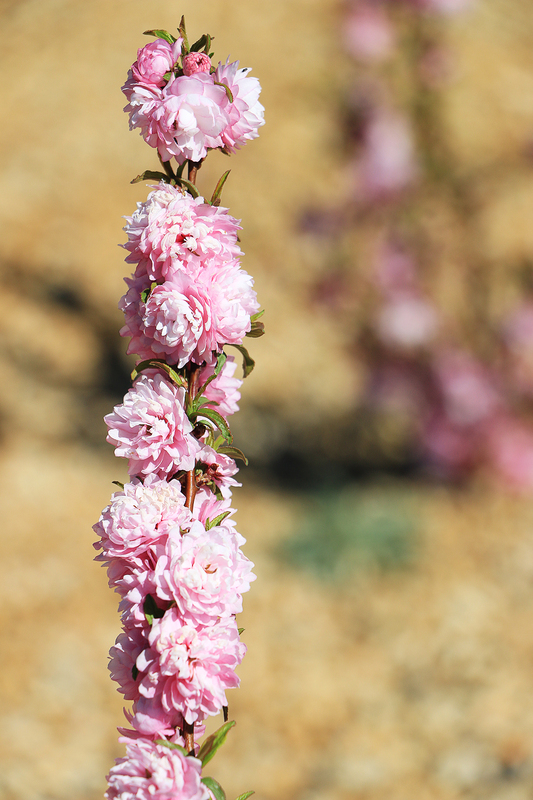 Prunus glandulosa | Flowering Almond is an ornamental bush that flowers in the Springtime. It produces no nuts, just effusive and sometimes fragrant flowers. Almond trees are what produce the nuts we so desire. I heard on NPR that it takes 100 gallons of water to produce a single nut. Well, these shrubs produce flowers only and are drought tolerant. That makes them a great addition to a water conscious landscape. I first saw Prunus glandulosa | Flowering Almond in bloom in Rochester, NY. Neighbors had them planted on the border of their yard, which abutted the driveway to our rented apartment. Imagine each branch covered in mini, rose-shaped blooms in a hue of pink; like cotton candy. They are one of those tell-tales that Spring has arrived. And while it surprised me to find them in a park in Albuquerque, I was overjoyed.